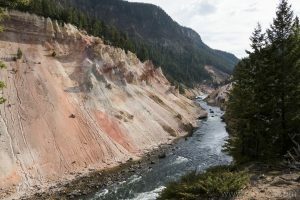 This trail steeply drops from the rim of the Grand Canyon of the Yellowstone River, past some hydrothermal features, to the colorful banks of the river. 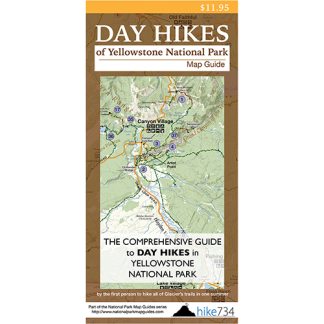 This trail starts by winding through a level, lodgepole forest. It pops out along the North Rim of the canyon with great views of the multi-colored canyon walls and crazy rock formations. The trail follows right along the edge, so be careful of your footing and don’t get too close to the edge. The slender Silver Cord Cascade from Ribbon Lake slices down the opposite canyon wall about 1mi/1.6km into the hike. Past the view of the cascade, the trail leaves the canyon and wanders through the forest for another 1.5mi/2.4km to a meadow, then a trail junction. Take a right at the junction towards the canyon rim, where it begins its precipitous descent into the canyon. The path switchbacks steeply through strikingly white rock. Views of the canyon are intermittent and then disappear as you descend into trees. A dormant geyser cone sits out of place in the forest, but is a sign of things to come. The trail eventually breaks out of the forest to a white landscape dotted with hydrothermal features. The trail descends steeply past bubbling pools, steaming cones, and dormant geysers. The fantastic canyon walls tower around you. The trail enters the forest again with intermittent views of the red, orange, pink, yellow, and stark white colored walls above the river. The trail ends at a beautiful spot along the river’s banks. Trailhead: Follow the one-way North Rim Drive and turn down the road to Inspiration Point. The trailhead is just west of the Glacial Boulder.